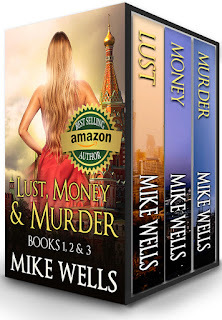 Mike Wells Official Website: FREE DOWNLOAD of Lust, Money & Murder, Book 1! FREE DOWNLOAD of Lust, Money & Murder, Book 1! For a limited time, I am offering Book 1 of my bestselling international thriller series, Lust, Money & Murder, as a free download to introduce new readers to the book set (13 books and counting, by stronger reader demand). BONUS: If you share the product page from my online bookstore on Facebook, you can get the entire first trilogy FREE - click here and you'll see the "Share & get 100% off" button below the book price. Books 1, 2 & 3 are also available in paperback here. Join the Mike Wells VIP Reader List (FREE!) and receive updates when any of my new books or audiobooks becomes available or are offered as free downloads.